This is the “Military Position” at AI8Z / N8SEW consisting of a WW2 AN/ART-13 Liaison Transmitter (mfgr. 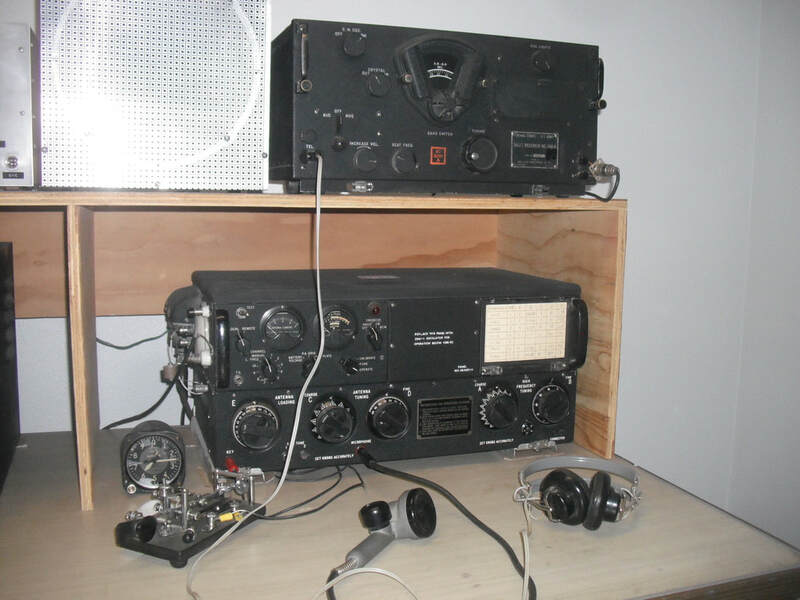 Collins Radio, used on B-17, B-24 and B-29 bombers), BC-348Q receiver (mfgr. Wells Gardner), J-36 “Bug” or semiautomatic key (mfgr. Vibroplex) and carbon element hand microphone. The instrument to the left of the transmitter is an aircraft altimeter, displaying 6250 feet (Cortez, CO altitude above sea level). The altimeter serves as a handy barometer for tracking approaching weather systems. I would love to add a clock from an aircraft of the same time period. The transmitter is the first example I know of for an aircraft “autotune” transmitter. Visible on the left side of the ART-13 panel is the LOCAL/REMOTE switch and immediately below is the ten position CHANNEL selection switch. Transmitter settings for up to ten frequencies can be pre-set using the dials along the bottom edge of the transmitter. A motor and mechanical cam arrangement “dial up” the settings corresponding to each of the ten channel selections. The system is an example of a mechanical memory. A remote control box was located in the cockpit enabling the pilots to operate the transmitter. This and other Collins Radio designs are mechanical as well as electrical marvels. I obtained the transmitter from a friend I assisted doing broadcast transmitter maintenance in the late 1980s timeframe. The story he gave me was that the transmitter had been stored in a Denver area high school principal’s chicken coop since the 1950s. Restoration work was mostly cosmetic. The transmitter contains the same tubes and components with the exception of the plate HV blocking capacitor that required replacement about ten years ago. The transmitter performed to specifications when I powered it up the first time, a testament to the people who designed and built this piece of equipment during the war. The "Enola Gay" was the B-29 bomber that delivered the atomic bomb to Hiroshima and photos show two ART-13 transmitters installed in the aircraft for that mission. I joined other ART-13 users for a QSO with “Fifi," the B-29 operated by the Commemorative Air Force during a flight between Midland Texas and an airshow someplace in the Midwest. The QSO was a success but the operator aboard Fifi had trouble hearing us above the noise from the aircraft’s engines. I operate this transmitter during weekly AM roundtables on Sunday mornings at 3885 kHz. It runs about 120 watts carrier output. 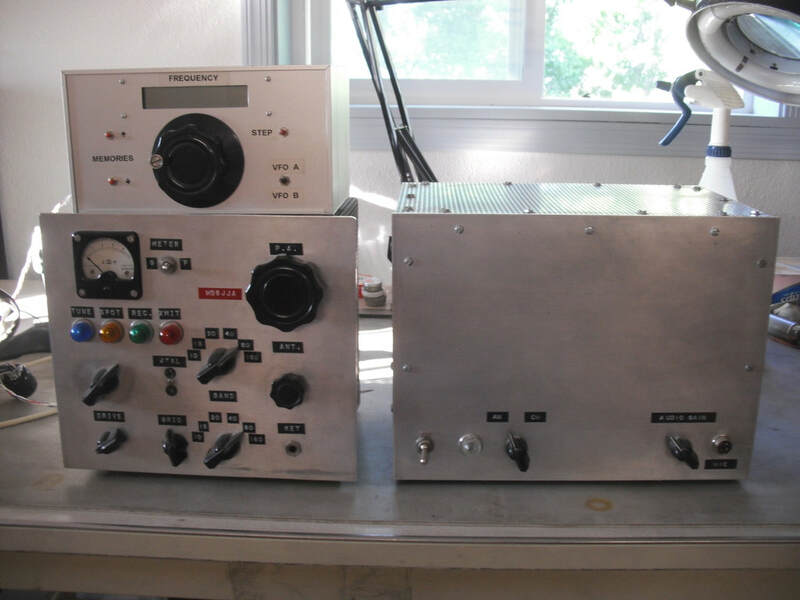 ​Attached are photos of the transmitter I built in 1971 with the help of Elmers W8BWE and WB8LMY. It was built from an article in the mid 1960s ARRL Handbooks. 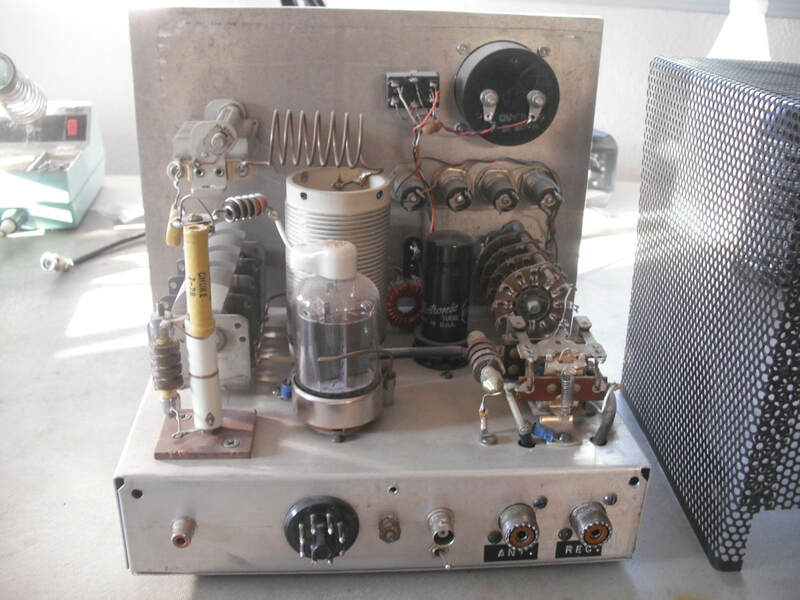 The tube complement is a 6AG7 driving a single 6146 for 75 to 90 watts input on CW. Originally crystal controlled, I used this transmitter for most of my Novice and early General Class QSOs. Later modifications include the addition of the 160m band and replacement of the original power supply (made from junk 1950s TV sets) with a power supply-modulator. The modulator mostly follows a design from the ARRL 1954 Handbook. It contains an ART-13 modulation transformer and uses a pair of 807 tubes for plate modulation. I use an Astatic dynamic microphone with this transmitter. The most recent addition is an N3ZI DDS based VFO that provides very stable and accurate frequency control on 160 through 10m. I use this transmitter with a Drake 2B receiver that I purchased used with money I earned mowing lawns one summer. I made many CW DX QSOs and earned my WAS certificate with this transmitter.